there are a lot of things that has remain unchanged for decades or even centuries, and among them, is padlock. we hardly think it ever need a change, mostly because we learn to live with keys and combination codes where lost keys and forgotten codes are a norm. we live with it anyhow. but a Utah-based firm begs to differ. 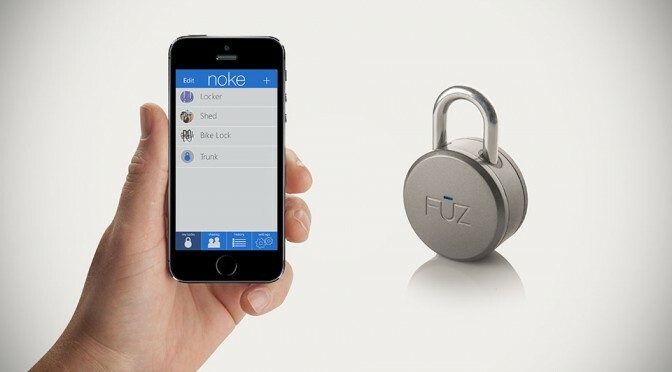 these folks think it is time for padlock to go high-tech and hence, they came up with Noke Bluetooth Padlock. if you really think about it, it is kind of no brainer – we are just waiting for someone to pitch the idea and so FUZ Designs did. i mean, virtually everything has or being Bluetooth-fied, and so seriously, why not a padlock? 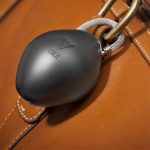 to stand up to rigor of outdoor use, such as on your bike, Noke is made waterproof and the hardware is void of buttons or keyholes, making it look exceedingly sleek and high-tech. getting started is pretty simple too; get it paired with your iOS or Android device, walk up to it and click on the Noke’s hook and it will start searching for the assigned device. if there is indeed an assigned device, it will unlock. 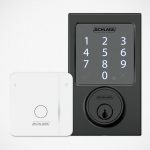 and being Bluetooth-enabled, it also allows you to share the lock with your friends with no keys or codes to pass around. the padlock runs on a user-replaceable CR3032 battery, which is good for up to a year. 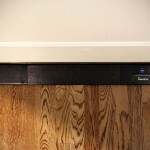 if the battery conks out, you will have a peace of mind that Noke will remain locked. all you have to do is to replace the battery (no tools involved) and life goes on as usual. however, if your device run out of juice, there is a pre-assigned click pattern to unlock it. just tap the hook in the sequence as predetermined by you and the Noke will unlock. almost seem like magic, doesn’t it? almost. at the end of the day, there’s no escaping from having to memorize codes after all, but it should be a good enough reason to ensure your device is kept juice all the time. in any case, it is still a piece of nifty high-tech hardware that aims to take us into the real future. 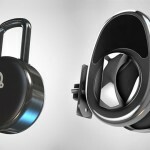 speaking of which, if you are ready for the future of padlock, then head over to the product’s Kickstarter page, where you will be able to pre-order one for just $59 – which is 30 bucks off the eventual retail price. check out a pitch video available after the break to see the lock in action.